Hi, my name is Trudy Race, Lead Instructor of Over the Hill Farm. Thank you so much for checking out our web site and our facility. Let me tell you a little bit about us. 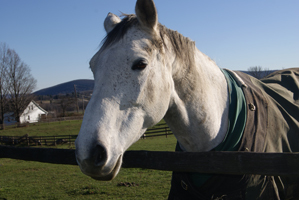 Over the Hill Farm is a boarding and training facility for the dedicated horseback rider. Our clients are focused on developing their horsemanship to competition levels. 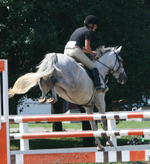 Everything from essential care of the horse to advanced riding skills is covered. We teach students of all levels and ages, beginning at 5 yrs of age. Our lesson horses and ponies are experienced and co-operative for children and adults to learn. Right now we are focusing on the Jumper and Equitation Divisions of Horse Showing. 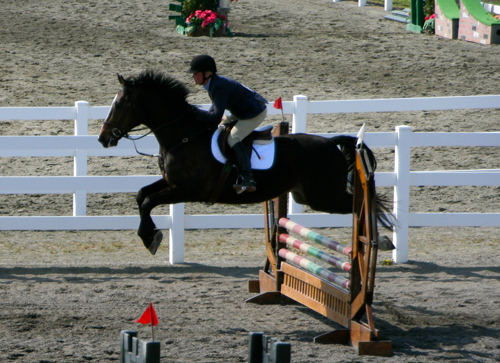 We have horses and riders in all levels of training, from walk/trot and green hunters to the 4'6" jumpers. Since 1984, students at the Over the Hill Farm have competed at local and "A" show circuits throughout the Northeast. In addition, we have competed in Dressage and 3-Day eventing at all levels, from the beginner to Olympic level. We do accept Ship-Ins for lessons. We will board and care for your horse as our own, on the condition that it has regular training. Our facility includes forty acres of turnout pastures, where geldings and mares are kept separated in groups of two to six in three rail board fence. We have a 75x160 indoor school, show barn, two outdoor rings. We use the best quality feed and bedding, and make most of our own hay. We provide hay outside during the winter, and daily turnout. Blankets and boots are changed at no extra charge, and we accommodate custom feed and supplements as the horses require. We take care of injuries, and will contact veterinarians and farriers as the need arises. We are knowledgeable horsemen, and we take very good care of the horses who live here. We teach our students to be horsemen as well, not just riders. 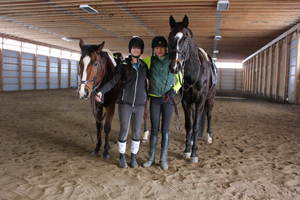 We match our students to the horses, for skill level and temperament. 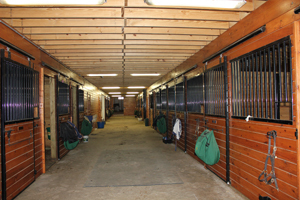 Over the Hill Farm has 16 matted stalls, a heated tack room, a wash stall, and a heated bathroom for riders. As for my own background, I began riding at three years old, showing at five, and eventing at nine. I made the Area II preliminary Championships at fourteen, in my first year of eligibility. I competed in the North American Young Rider's Championships at seventeen, achieving a personal bronze and a team gold. I qualified for the Pan American Games in 1994, and was on the short list for the Olympics in 1996. I first competed in the Fair Hill International three-day when I was eighteen, and at the Rolex Kentucky three-day at nineteen. Over the years I've had the good fortune to train with Olympic Gold Medalist Bruce Davidson, named one of the fifty most influential horsemen of the 20th century by equine magazine The Chronicle of the Horse. I've trained and competed in England and Italy, and across the United States. I still compete, although since the birth of my son, I've focused Primarily on Jumpers up to level 6. My students are never rushed, but they are also never held back. They advance as quickly as their skill and dedication allow. I teach them not only about the skills of riding, but also the proper care for their horse. Good horsemanship involves far more than being able to ride well. It's about knowing the horse, when the horse is tired or injured. A horseman knows what work is required to make the horse ready to perform and knows when the horse is ready for the task. All aspects of training is what makes a good horseman. My students also are required to dress properly and wear the proper safety equipment. Beyond the safety aspects—which are of the utmost importance—this also increases the student's focus and allows for the proper attitude. Over the Hill Farm is not a casual facility We only accept riders who truly want to learn excellent horsemanship, and who want to continually improve their skill. If you are one of those riders, please get in touch with us. We'd love to work with you. You can find us 1/2 mile west of exit 197 of Interstate 81 on Route 632. You can get detailed directions by clicking on "Directions" in the Google Map below. Or just click here. Web Site Design and Hosting by Shuta Multimedia.